I just received an e-mail purportedly co-authored by UVa President Teresa Sullivan and Rector Helen Dragas. The e-mail promises cooperation and hand-holding and lots of hugs and kisses and warm fuzzy stuff. In other words, it’s total P.R. trash designed to reassure the dulled wits of the extra gullible. If you haven’t been following the story, Dragas is the head of UVa’s Board of Visitors. 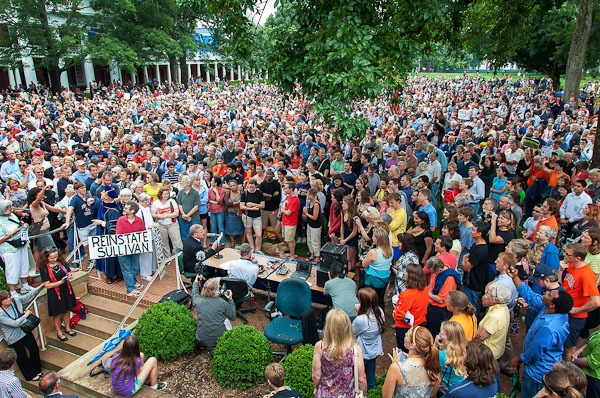 In early June 2012 she led a quiet coup to have Sullivan removed as President of the University, dropping the news a week after the student body had left town for the summer. On a Sunday. The whole thing stank of dirty pool. As an alumnus of the University and one who has followed recent events closely, I am confused by Helen Dragas’ continued presence as Rector of UVa’s Board of Visitors. Regardless of Ms. Dragas’ proclaimed professional accomplishments in other arenas, it seems clear that she is at the very least conspiratorial, dishonest, short-sighted and bold to the point of recklessness. After her failed coup attempt at the University, we can surmise that Ms. Dragas is not someone who can be relied upon in any professional capacity, that she does not nor has she ever had the University’s best interests at heart, and that she is, in short, a venomous operative who sheepishly returned to the negotiating table only after having her proverbial buttock handed to her by the University community, the faculty, and ultimately, the Governor of the Commonwealth of Virginia himself. What sort of hubris does a person require to make such a massive public error of judgement and then turn around and try to pretend that all is right in the world? I am certain that I am not alone in assuring you that no faith shall ever be placed in Ms. Dragas as relates to directing the future of the University. I hope that the Board and other governing bodies will reflect deeply on this matter and consider an early retirement for Ms. Dragas. This entry was posted on July 16, 2012 at 4:32 pm and is filed under cripsyduck with tags Board of Visitors, Helen Dragas, Teresa Sullivan, UVa. You can follow any responses to this entry through the RSS 2.0 feed. You can leave a response, or trackback from your own site. You should really be sending your letter to the Governor. Problem is, he has and will continue to simply appoint more like Dragas (or worse, even more stealthy) to replace her… so there is more to the story than Dragas (i.e. we need a new Governor and/or an effective State Legislature, along with complete reform of how these boards are appointed/elected), though I certainly agree that Dragas needs to be gone before any actual “healing” can take place at UVA. Yes, I am also impressed with McDonald’s hubris in re-appointing Dragas when he had a chance to bring in someone new and give the U a fighting chance. That is transparent!